The Woman in Black tells the tale of Arthur Kipps (Daniel Radcliffe in his first feature role since the Harry Potter franchise), a lawyer who is forced to leave his young son and travel to a remote village to attend to the affairs of the recently deceased owner of Eel Marsh House. Working alone in the old mansion, Kipps begins to uncover the town's tragic and tortured secrets and his fears escalate when he discovers that local children have been disappearing under mysterious circumstances. When those closest to him become threatened by the vengeful woman in black, Kipps must find a way to break the cycle of terror. With a strong supporting cast including Janet McTeer (Albert Nobbs, Tumbleweeds), Ciarán Hinds (Tinker, Tailor, Soldier, Spy), Jessica Raine (Call the Midwife, Robin Hood), Shaun Dooley (Great Expectations, South Riding), based on the novel by Susan Hill and produced by Hammer Films, The Woman in Black is one of the better cinematic ghost stories of recent years. 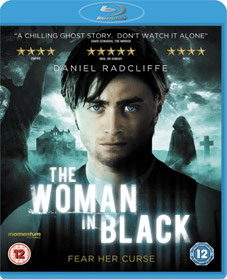 The Woman in Black will be released on UK DVD, Blu-ray and digital download on 18th June 2012 by Momentum Pictures at the RRP of £17.99 for the DVD and £19.99 for the Blu-ray (the price of the download has yet to be confirmed).